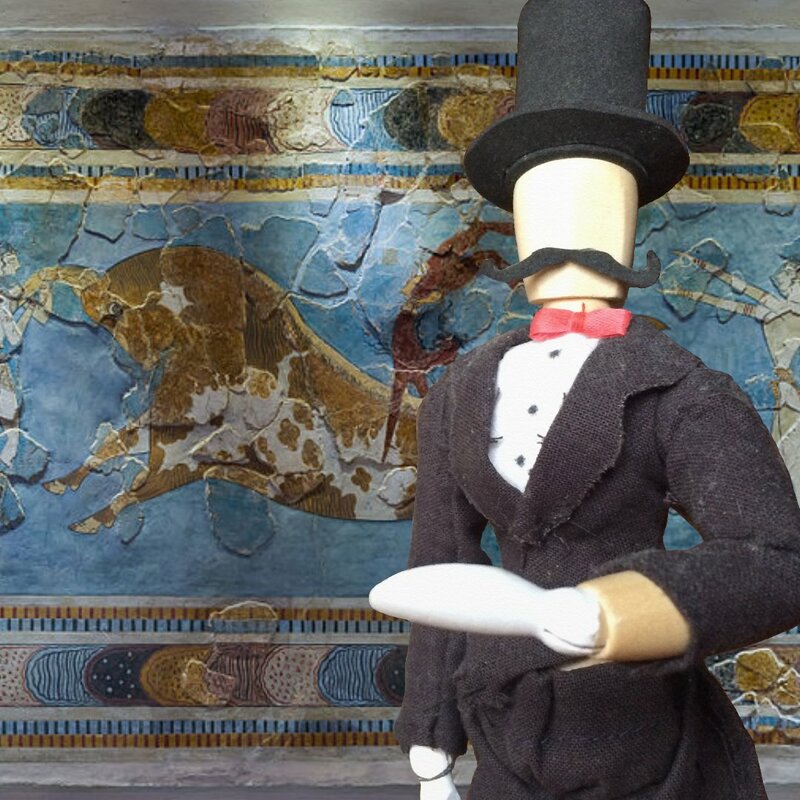 Today, Sylvester is going to tell us about the Toreador Fresco and the Palace of Knossos. That’s right, the one with the Minotaur from ancient Greek mythology. Did you know the palace there actually exists?! Up until the late 1800’s, almost everything we knew about ancient Aegean culture came from The Iliad and The Odyssey by Homer. You may have noticed that those stories aren’t exactly bursting with fact. Sylvester noticed that too. Me, I like fiction. But Sylvester apparently just had to know what was really there. (Once again, he’s aging himself by telling me all this. He went on an expedition to find out if there was actually anything having to do with the stories.) Excavations began in Asia Minor, Greece, and Crete in the 1870’s in order to find Troy. Archaeologists have found all kinds of artifacts, and though a lot of it contradicts Homer’s works, much of it actually is consistent. We can’t understand most of the writing that’s been earthed up, but one thing written in the universal language which we can at least make bad attempts at interpreting (blame Sylvester for that assessment) is the art. 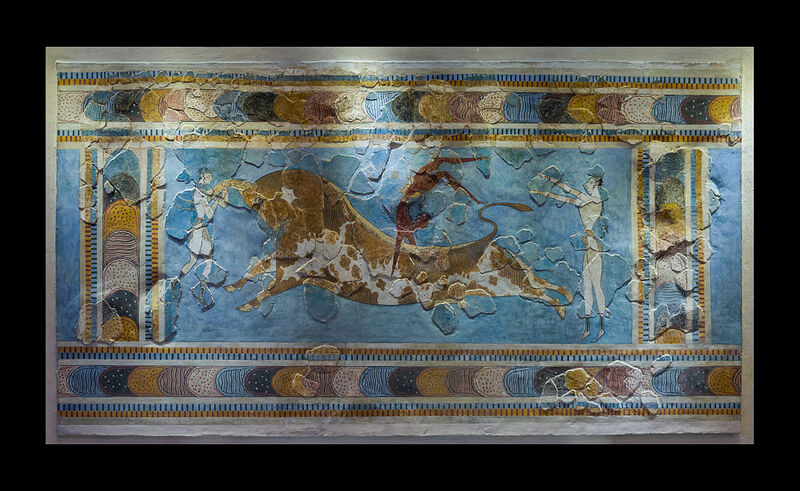 One discovery which is of particular interest is the Palace of Knossos on the Island of Crete, found by Sir Arthur Evans. This palace was the source of the stories about King Minos, the labyrinth, and the Minotaur. The palace actually does have a maze-like structure, possibly used as a defensive strategy. It doesn’t have any other clear fortifications, and the entrances aren’t obvious. (Sylvester got hopelessly lost there but he doesn’t like to talk about it, so we’ll move on.) The myth’s explanation of the layout of the palace was that King Minos commissioned the architect Daedelus to construct the labyrinth (or the entire palace, depending on the story). The labyrinth was impossible to navigate without a guide, and it was home to the Minotaur, half man, half bull. It’s easy to see how that story could have come from a maze as a defensive strategy. The interior was richly decorated with wall paintings (frescos). No one knows for sure how the palace functioned, but the richest area seemed to be in the center. One example of art from the palace is the Toreador Fresco. It’s the best restored fresco from the complex. It depicts a bull and suggests that bull jumping must have been a sport in the culture, which is significant because the myth goes on to tell how Theseus eventually braved the labyrinth and killed the Minotaur. This is one example of how art is so pivotal in giving us a sense not only of history, but also of how stories which have been passed down for millennia came to be.